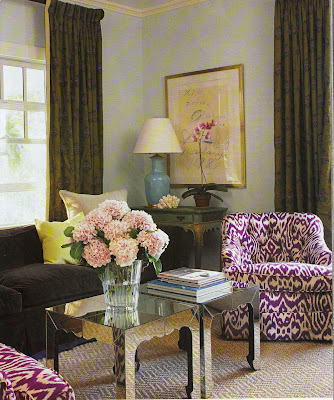 ...it would be in Madeline Weinrib's purple ikat. And I'm not even a purple fanatic! But I cannot get enough of the GORGEOUSNESS (is that a word?) of these chairs. I know we've all seen these images before. But I had to post them before I forget them. And quite frankly I can't think of a more sad day than a day that I forget these purple ikat chairs exist. 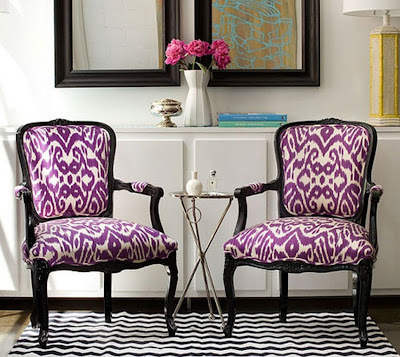 Does anyone know where I can find a cheaper version of purple ikat? It doesn't have to be silk. It can be polyester for all I care. Ok, I take that back. Help? Anybody? This is the plea of a desperate design fanatic. 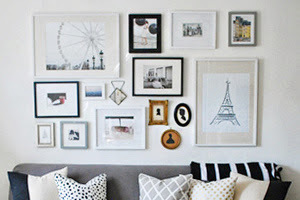 In other news, thank you, Emily Clark, for showing me that my living room was included in Houzz.com's Ideabook this week and is described as having a "perfect floor plan. Ample seating, and well placed lighting and tables." You have to scroll down a bit but I pinky swear it's there. 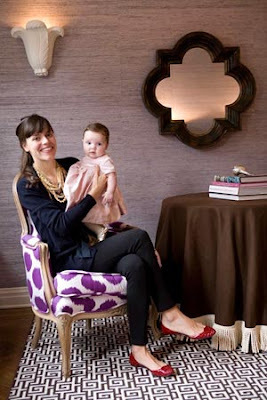 I'm not a big purple person either, but I love that fabric and those chairs. And congrats on the mention! That's awesome. And, I was just getting ready to say you must be on a purple kick. Didn't you say you were getting ready to paint some nightstands??? Gorgeous! 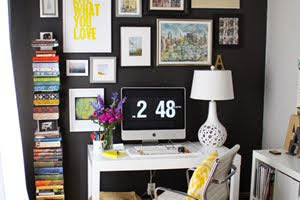 I'm not a purple fan either, but I have been thinking about using it as an accent in my bedroom. Thanks for the inspiration! Have you been to Fishman's Fabrics on Desplaines (south of the loop)? They have so many options that I have to believe they would have a cheaper alternative. Oh I love this pattern! The third picture has my favorite fabric. May have to rethink the use of purple at least one piece. I'm never a fan of ikat, but these are just lovely! I've changed my mind about the print. Love that fabric! It's so pretty! If I could reupholster the world it would be in Marimekko's Juhla-Raita (black & white stripe) so the whole world would remind me of an awning above a French patisserie... or Florence Broadhurst's Japanese Floral (also in black & white). Those chairs are gorgeous! Oh MW stuff is so so good. I used to HATE purple. Swore I'd never like it. Then I picked up 2 very small mercury glass candle holders that were purple. I didn't think much of it till I walked passed them (on a window sill) and noticed how pretty they were. So now I'm always on the lookout for purple, but I can't believe how hard it is to find purple things! The chairs are amazing. I LOVE purple and am a huge fan of ikat - this fabric rocks! I want it in my next house. Thanks for sharing.